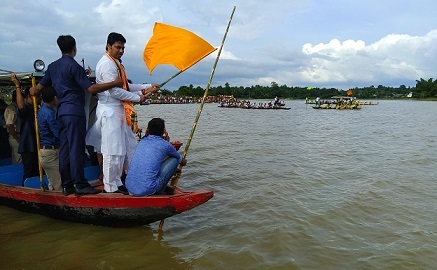 The annual boat race of Tripura was flagged off on Monday by Tripura Chief Minister Biplab Kumar Deb in Melaghar which apart from being a major tourist attraction for the Neermahal in mid of the Rudrasagar Lake, is also venue for yet another splendid, unparalleled attraction in the region. The boat race is an event that is as much part of the local fisherman community ethos and is a sport that signifies the excellent team spirit, integration and amity of the people. It is an occasion of great excitements that reflects a vibrant people. Both men and women with scores of long snake boats and other smaller crafts participate in the events. The boat race is one of the popular festivals which also attract the tourists. Thousand others like her from not only the state but also from neighboring states gathered here to enjoy the race. The race is organized by the Information Cultural Affairs & Tourism Department and the local fishermen community. Along with the Chief Minister, State Tourism Minister Pranojit Singha Roy and other MLAs were also present there. 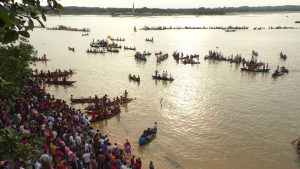 CM Deb said that the Neermahal palace is one of the prime spots in the State which attracts a large number of tourists and the annual boat race added to that. Deb announced that to further add to the tourist attraction the State Government would supply 50,000 white ducklings which would not only add to the income of the fishermen community there but will also help the State towards egg self-sufficiency. The water carnivals erupt every year in a dramatic spectacle and hold tens of thousands of people spell-bound, cheering the action, laying bets, goading the boatmen to row faster.